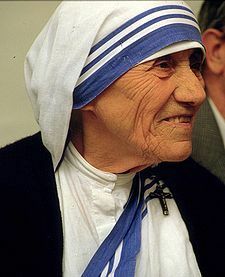 Mother Teresa (26 August 1910 – 5 September 1997), born Agnesë Gonxhe Bojaxhiu (pronounced [aɡˈnɛs ˈɡɔndʒe bɔjaˈdʒiu]), was an Albanian Catholic nun with Indian citizenship who founded the Missionaries of Charity in Kolkata (Calcutta), India in 1950. 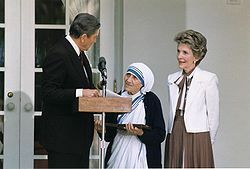 For over 45 years she ministered to the poor, sick, orphaned, and dying, while guiding the Missionaries of Charity's expansion, first throughout India and then in other countries. Following her death she was beatified by Pope John Paul II and given the title Blessed Teresa of Calcutta. Agnesë Gonxhe Bojaxhiu (Gonxhe meaning "rosebud" in Albanian) was born on 26 August 1910, in Üsküb, Ottoman Empire (now Skopje, capital of the Republic of Macedonia). Although she was born on August 26, she considered August 27, the day she was baptized, to be her "true birthday." She was the youngest of the children of a family from Shkodër, Albania, born to Nikollë and Drana Bojaxhiu. Her father, who was involved in Albanian politics, died in 1919 when she was eight years old. After her father's death, her mother raised her as a Roman Catholic. According to a biography by Joan Graff Clucas, in her early years Agnes was fascinated by stories of the lives of missionaries and their service, and by age 12 was convinced that she should commit herself to a religious life. She left home at age 18 to join the Sisters of Loreto as a missionary. She never again saw her mother or sister.